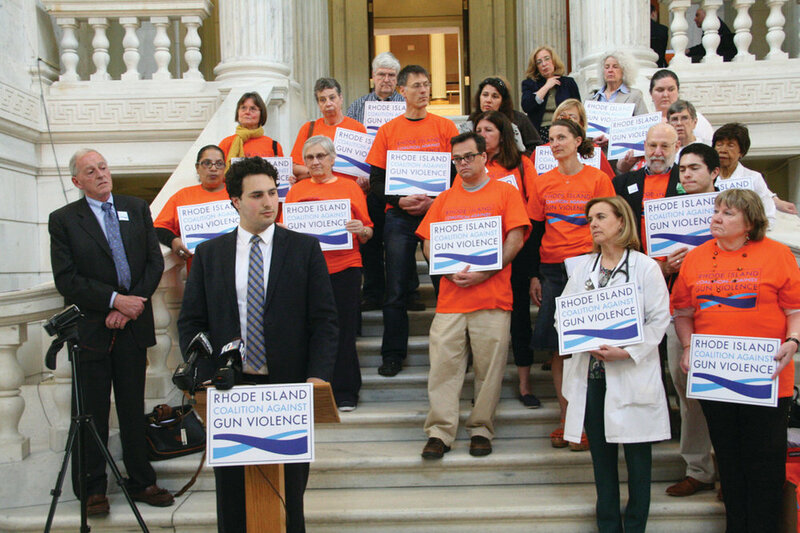 Aaron is passionate about common-sense gun violence prevention. As a State Representative, Aaron stood up to the NRA, helping pass legislation to protect victims of domestic abuse and introducing legislation to limit high capacity magazines for fire arms. As Lt. Governor, Aaron will keep fighting to end the gun violence that has impacted so many in our communities. Every year since his election, Aaron has introduced legislation to create a single payer "Medicare-for-all" system in Rhode Island. He believes that healthcare is a fundamental human right, not a privilege for those who can afford it, and as Lt. Governor he will fight every day to make that vision a reality in our state. Aaron is running to stand up for Rhode Island's working families. He led the fight to win paid sick days for over 100,000 families who did not have them, and has championed legislation to raise wages and ensure Rhode Islanders have access to safe, family-supporting jobs. As Lt. Governor, Aaron will fight to make our state government work for everyone, not just the wealthy and well-connected few. Aaron's grandma, Bunny, was executive director of her Planned Parenthood chapter in the years before Roe v. Wade. We cannot go back to those days. Aaron has been a champion for reproductive rights in the State House. As Lt. Governor, he will fight to pass legislation codifying Roe v. Wade here in Rhode Island. We can, and we will, stand up to protect a woman’s right to choose, no matter what happens in Washington. Fighting climate change is a moral necessity. It's also an incredible economic opportunity for our state. Aaron has passed critical legislation to expand renewable energy, but we need to take more ambitious action. As Lt. Governor, Aaron will lead the charge to take wind and solar to scale in our state. Together, we can transition to 100% renewable energy by 2050, and put literally tens of thousands of Rhode Islanders to work doing it. Aaron helped Providence Public School students win healthier lunches, access to free school transportation, and more. As a legislator, Aaron helped win greater investments for our young people and brought attention to our crumbling school buildings. But there's so much more to do. As Lt. Governor, Aaron will keep the spotlight on fixing facilities and funding programs - arts, personalized learning, smaller classes, social workers - that our kids need. As Lieutenant Governor, Aaron will work to put small businesses at the front and center of state economic development. That means fighting to ensure state resources aren't just going to big companies, but are being invested in small businesses across Rhode Island. It means passing tax reforms like a graduated corporate minimum, so that mom and pop stores aren't paying the same amount as Walmart and CVS. And it means pushing every state agency to examine operating procedures to make interactions with new and existing businesses as easy and stress-free as possible. Thousands of Rhode Islanders work hard every day to ensure elderly family members are able to age in dignity. Yet they struggle with a lack of accessible, affordable options to support their loved ones. The Lieutenant Governor chairs the Long Term Care Coordinating Council, and in that role Aaron will lead the charge for a public long-term care insurance program to support families in this critical care-giving.